Here's an app that helps artists and photographers frame artwork. Normally, there is a lot of math calculations to figure out dimensions. If you mess up the calculation and cut wrong you're throwing away money on mat boards. ($6-$15) I also struggle with visualizing the end result, so I built a live preview that changes as your resize. There are currently no apps that show real-time feedback for mat border dimensions. I use multi-touch gestures to enable natural control. Slide left/right or up/down on the numbers to increase or decrease the values. I have some cool new designs for the app, reorganized it so that touch input was along the bottom, and added a new crop screen. The layout has changed, so there is now a navigation bar on some screens that pop up from the bottom of the screen (modal transition). I've skinned all of the backgrounds with custom images using Photoshop. 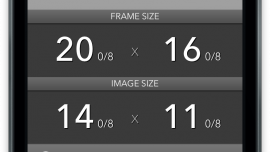 And I added a crop screen where you can choose different aspect ratios to crop an image. TODO: I plan to add help screens to show users how to use the app. That'll be another side scrolling screen.